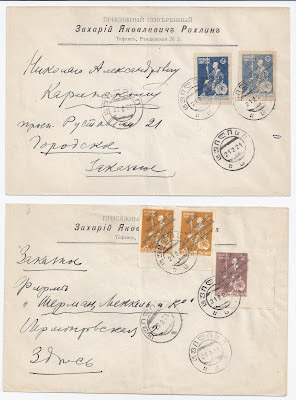 Trevor Pateman's Philately Blog: Georgia 1921 "De Jure" overprints and the "Constantinople Group"
Georgia 1921 "De Jure" overprints and the "Constantinople Group"
- a TBILISI serial "z" with no dots either side of the serial and dated 22 2 21. 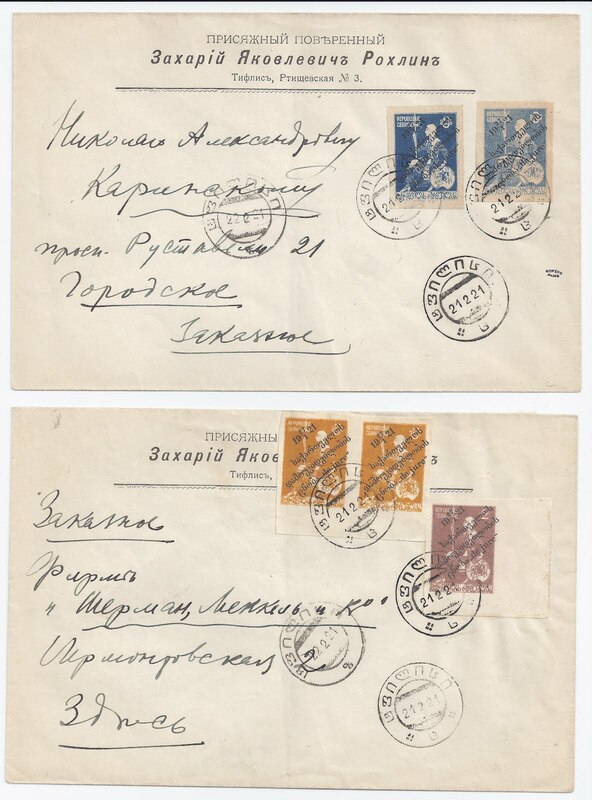 Now, the only real question of interest is this: were these covers favour cancelled at a Tbilisi post office counter, just before the Bolshevik capture of Tbilisi on 25 February, or not? And, if not, where were they cancelled. Peter Ashford in his Georgia: Postal Cancellations 1918 - 1923 lists the first "ts" cancellation as genuine type, gives it the number Type 26A but says of it, "So far only seen dated 21.2.21 on philatelic covers bearing top values of "De Jure" issue, cancelled for friends of S.Rockling. Confirmation of other usage awaited" (page 68). In my opinion, it is more probable that either both these cancellations are genuine or that both are fake. On the one side,these cancellations are well-made devices in a style very close to that of other Tbilisi cancellations. The ink pad used yields impressions which are similar in colour and so on to that of clearly genuine cancellations of the period. Of course, it could be that they are genuine post-office made cancellers which, along with an ink pad, found their way to the other side of the post office counter and thence to a Forger's Den in Constantinople. It could also be that they were made privately in Tbilisi for someone who knew he was going to (have to) leave and wanted them to take with him, to Constantinople. Given their quality, it seems less likely that they were made in Constantinople. Crucially, unless we can find examples of BOTH of them used on uninteresting mail before or after 21/22 2 21 it seems unlikely that they were at the post office counter in Tbilisi on JUST those two days. It seems more likely that they were never there and that, wherever they were made, they were only used in Constantinople to create what French dealers now like to call produits philatéliques. I probably would not have put you through this analysis but for one thing: on the first cover illustrated above (blue stamps) on the right towards the bottom, is the house mark of ROMEKO PARIS. Which brings me to the "Constantinople Group", the subject of my next Post. Quick comment on Serge Rockling/Rokhlin and Romeko. Maison Romeko Was actually founded by two gentlemen: Serge Rockling and a Mr. Meckel. The full name of the company is Rockling-Meckel Compagnie (Kompanya? ), or RoMeKo. Mr.Meckel's son was a BSRP member for many years and I had the pleasure of meeting him at London 1990.